As we get older, our eyesight tends to falter a bit, and achieving critical focus through the viewfinder alone becomes more difficult. Fortunately there are several camera focusing aids you can use to help you achieve critical focus with poorer eyesight. DSLR’s have an optical viewfinder as the primary framing and focusing tool, using prisms and/or mirrors to provide a crisp, if somewhat restricted view of the scene as seen by the attached lens. Mirrorless interchangeable lens cameras (ILCs) and compact digital cameras generally have an electronic viewfinder (EVF) that samples what the camera sensor sees and presents it in the EVF. EVFs can sometimes be problematic, providing a jittery image. Modern cameras, including DSLRs, mirrorless interchangeable lens cameras, and compact digital cameras, generally also have a good-sized LCD display at the rear that can be used to check focus. Typically, for DSLRs in normal mode, the LCD is used to review the image after the shutter has been pressed. The image can be zoomed and panned to check to see if you’ve achieved critical focus. In order to use the LCD as a larger focusing tool, the camera must Be placed in its live view mode. In live view, the camera’s mirror is locked in the up position, and the LCD displays exactly what the lens sees in real time. Being able to compose and focus on a 3″ LCD screen rather than squinting through a viewfinder is a great benefit for the aging photographer. The downsides of live view are slower focusing and the fact that you’ll be holding the camera at arm’s length, instead of pressed to your eye, making for less steady shooting. Focusing with live view works best when the camera is supported by a tripod or monopod. Mirrorless interchangeable lens cameras also allow switching between the EVF and LCD for composing and focusing, and compact digital cameras generally use the LCD as the primary focusing tool. Since ILCs and compact digital cameras are smaller and lighter than the typical DSLR, you will experience less camera shake when handholding. Another downside for all cameras with LCD screens is the ability to see the screen in bright sunlight. Although camera LCDs are getting better and brighter, this is still a problem for many photographers. 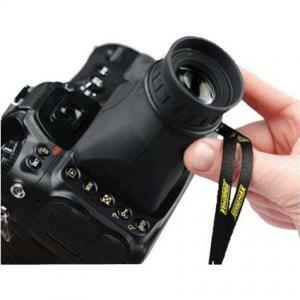 Use of a loupe, a device for blocking extraneous light and in some cases magnifying the LCD image, can be extremely helpful for the aging photographer. As an aging photographer, what would you give to be able to shoot low angle photos, for example, flower photography, without having to bend down or get down on your knees or tummy to look through your viewfinder or at your (non-swiveling) LCD? What would you give to be able to focus on a high-resolution 4 inch diagonal or a 9+ inch diagonal screen you can hold in you hand, rather than on the camera’s LCD? For the relatively modest sum of US$299.99, I became the proud and grateful owner of a CamRanger wireless remote camera controller. [NOTE: the original CamRanger has been discontinued. There is a CamRanger mini currently available for $199.00 with the new CamRanger II becoming available in 2019]. For me, with a bad back, bad knees, and less than perfect vision, the CamRanger has been a godsend, and cheaper than chiropractor fees. I use it for my landscape and flower photography, and even for photographing my wife’s displays of Department 56 lighted ceramic houses. She collects their Snow Village line and creates 4 foot x 8 foot seasonal displays using their houses and accessories. My CamRanger facilitates composing and focusing the extreme close-up shots I take of her life like displays. CamRanger is a stand-alone device that connects to select Canon or Nikon DLSR cameras with a provided USB cable. It creates an ad-hoc Wi-Fi network to which your device (iPad, iPhone, iPod Touch, Android, or Mac or Windows computer) can connect to receive streaming Live View images . The free CamRanger app enables you to control your camera from the remote device. There is no need for a computer or existing Internet connection. CamRanger supports HDR (High Dynamic Range) capture, allowing you to take a series of bracketed pictures automatically varying Shutter Speed, Aperture, or ISO. It also supports intervalometer and bulb settings for time lapse photography and automatic focus stacking for enhanced depth of field in macro photography. The CamRanger folks are always innovating. They’ve recently released a new motorized tripod head. When the CamRanger PT Hub and MP-360 motorized head are used with the CamRanger, you can easily pan or tilt the camera directly from the CamRanger app. These days I always pack my HoodLoupe and my CamRanger with me on my photo treks. They are compact and store easily in my camera bag. I use my HoodLoupe for quick composition and focus checking when shooting handheld or when using a monopod, and my CamRanger for all my tripod work. Try them. They are certainly a boon for the aging photographer. A few years back, I noticed a few unusual small growths on my forehead and cheeks. I went to a dermatologist to get them checked, and found out that they were small carcinomas – skin cancers. As we get older, after years of exposure to the sun, our risk for these kinds of cancers increases. Luckily for me, this type of skin cancer is easily treatable. I left the dermatologist’s office with a stern warning to wear a wide-brimmed hat whenever I was outside, to avoid developing additional skin cancers in the future! Ball caps were out. They don’t shade much of the face. Cowboy-style hats were better, but with generally high crowns, were wind magnets. Drover-style hats were a better choice. I stopped by my local Gander Mountain store to see what they might have. As soon as I spotted the Tilley Endurables hats, I was sure I had a winner. Tilley Endurables are just that, built to survive the outdoors and guaranteed for life. They are also insured against loss for two years. Can’t beat that! This Insect Shield Hat helps protect you from mosquitoes, ticks, no-see-ums, and other biting insects during all your outdoor adventures. It has a wide, down-sloping brim that gives you excellent protection from the rain. It has a certified UPF 50+ rating blocking 98% of harmful UVA/UVB radiation. The hat is treated with an odorless, invisible repellent bonded to the 100% cotton duck fabric. It keeps performing after repeated washings. The Tilley Insect Shield hat, like most Tilley hats, fits loosely on your head, but won’t fly off in the wind thanks to its tuck-away adjustable wind cord. In addition, the hat floats, thanks to a layer of closed-cell foam in the crown. It also has a hidden pocket inside crown with a Velcro closure to tuck away cash or credit cards. It’s crushable and packable for easy storage, and of course guaranteed for life not to shrink, wear out, or fall apart. The brim measures 3-1/2″ in the front and back and 2-1/2″ on the sides. The hat weighs 5.5 oz. This hat is more of a fall/winter weight hat. For summer, I chose another Tilley Endurable. Mesh incorporated into the crown of the Tilley Airflo allows for air circulation and helps keep you cool. 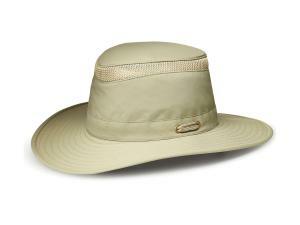 This water-repellent hat offers an excellent UPF 50+ sun protection rating, a broad brim, and a tall crown. It’s constructed from Tilley’s patented Nylamtium, a super-tough water and mildew-resistant nylon blend. The hat ties on in the wind to keep it firmly on you head. The hat also is available in Olive. Like all Tilley hats, this hat is guaranteed for life and insured against loss. It’s machine washable and won’t shrink. The brim measures 3-1/4″ in front and back and 2-1/2″ on the sides. The hat weighs 4 oz. My Tilley hats have seen rough use, gotten wet, muddy, and windblown, and still keep on protecting me on all my outdoor adventures. Keep yourself protected from the sun – wear a hat outdoors !! As an aging photographer, I find that trekking along forest trails can present some challenges for balance in negotiating rough or steep terrain. I also find that my legs get more tired than and my knees don't hold up as well as they used to in my younger days. Using a hiking staff or trekking poles can help improve balance and transfer some of the load from the legs and knees to the arms and shoulders. For me, hiking uphill or downhill, or for long distances while wearing a camera backpack, necessitates the use of trekking poles. Even when spending a long day in a botanical garden, my trekking poles reduce my fatigue and provide a handy mechanism to lean and rest, when there's no place to sit down. 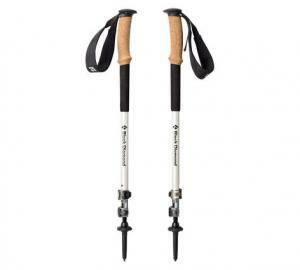 I also prefer a pair of trekking poles to a single hiking staff for better balance and a more natural stride. Trekking poles come in several styles and are generally constructed of carbon fiber or aluminum. Carbon fiber is lighter and stiffer, but may break more easily with rough or careless use. As an aging photographer who likes to keep his gear as lightweight as possible, I prefer carbon fiber. In addition to their construction material, trekking poles vary by the number of sections, weight, adjustment and locking mechanisms, grips, tips, collapsibility, and if they provide a shock absorber mechanism. For lightweight packability, I prefer a three-section carbon fiber pole. I also prefer cork grips. Grips are a matter of preference - rubber sheds water well; foam is much softer; and cork will break in to conform to the shape of your hand, also allowing a firm grip on the poles when the grips get wet. Most trekking poles also allow you to change tips from carbide tips for gripping the trail, to rubber tips for walking on paved surfaces. I found in using carbon fiber poles that a shock absorber mechanism is unnecessary and could also be a potential detriment to stability when digging in. Outdoor Gear Lab did a comprehensive review of trekking poles, naming the Black Diamond Alpine Carbon Cork poles their top-rated Editor's Choice. They described the poles as lightweight, very strong for a carbon fiber pole, with an excellent locking mechanism, and the most compact telescoping pole in their review. These are the poles I use and love. Black Diamond poles took the top three spots in their review, with two Leki poles rounding out the top five. Do yourself a favor, save your back and knees, avoid falls, get a good pair of strong, lightweight trekking poles. You won't be sorry. In Part 1 – Linville Falls, NC, I talked about my trek down the Blue Ridge Parkway in North Carolina to shoot waterfalls, stopping first at Linville Falls. As mentioned, I have a bit of trouble walking distances and find uphill and downhill grades a challenge. The trek to the Chimney View was quite a bit more strenuous that I had anticipated. After continuing down the Parkway doing a bit of sightseeing, I stopped in Asheville for the night to regroup and plan the next day’s waterfall trek. Both the guide to Hiking Waterfalls in North Carolina, by Melissa Watson, and Kevin Adams’ North Carolina Waterfalls – A hiking and Photography Guide, suggested that the Brevard area southwest of Asheville had some great easy access waterfall locations. I decided to head to the DuPont State Forest to shoot Triple Falls (seen in the Hunger Games) and High Falls. What most attracted me to these falls was not just their beauty, but their accessibility for the aging photographer. If you are a visitor with disabilities, you can obtain a permit to enter the gate at the High Falls access area on Staton Road and drive to High Falls, Triple Falls and the covered bridge. After my too strenuous Linville Falls adventure, the idea of driving to a waterfall, instead of hiking miles of forest road, was very appealing. •A vehicle permit must be requested 48 hours in advance of your planned visit. •Permits are only available Wednesday through Sunday between the hours of 11:00 a.m. and 4:00 p.m.
•To schedule a visit, call the Forest Supervisor’s office at (828)877-6527. •You will need to provide your name and the date you would like to visit. •A ranger will meet you at High Falls access area with a vehicle permit and a trail map. Don’t be late for your scheduled appointment, or no one will be at the gate to open it for you. •You must display your vehicle pass on the dashboard of your car while driving in the forest. •You may only drive to the specific locations on the permit. The RomanticAsheville.com website had a good bit of detailed information about the Forest and the falls on their DuPont State Forest page. For the location and directions to DuPont State Forest, see the Getting to DuPont State Forest section at the end of this article. The Hiking Waterfalls in North Carolina guide categorized the hike as Moderate, with a 1.2 mile roundtrip distance to Triple Falls, and a total 4.8 mile roundtrip hike to both Triple and High Falls. Driving to Triple Falls was a somewhat bumpy pleasure. You traverse narrow forest roads (be careful if your vehicle has particularly low clearance) to reach a small turnaround with a picnic table, just above Triple Falls. From there it is a moderately steep trek on the trail down to the Triple Falls overlook (use your trekking poles!!). Fortunately, you’ll be hiking for less than 200 yards down to the overlook. Going down is easy, coming back up loaded with photo gear is a bit harder. More fortunately, when you arrive back at the turnaround, your vehicle will be waiting for you. From Triple Falls, you can drive back out to the main forest road and turn left on the road to High Falls. The road is a bit bumpier and steeper (in some spots, you might have to stretch a bit in your seat to see over your hood), ending at a large overlook with a picnic shelter and porta pottys. The view of the falls from the overlook is magnificent. If you are able, you can also walk down a long set of stairs to getting a lower and more intimate view of the falls. Last fall I planned a trek down the Blue Ridge Parkway in North Carolina, to shoot, among other things, waterfalls. I have a bit of trouble walking distances and find uphill and downhill grades a challenge. I checked out several guidebooks and an amazing website I’ll discuss a bit later, to find waterfalls that were both photogenic and reasonably accessible. I started with Nye Simmons Best of the Blue Ridge Parkway. This guide contains milepost-by-milepost information on attractions, points of interest, scenic overlooks, and waterfall photo opportunities. The guide includes some great full color pictures that get a photographer’s juices flowing, and photo notes that help get the shot. The guide also includes information regarding dining, lodging, and gasoline availability along the Parkway and in nearby communities. Since I was starting out in Boone, NC and heading south, I decided to stop at Linville Falls and try to capture the classic “Chimney View” of the falls. This view provides opportunities for portrait shots of the upper and lower falls, wider shots showing a bit of the Linville River and the surrounding woods, and close-ups of the lower falls. The Best of the Blue Ridge Parkway suggested that the hike in from the visitor center would be a bit over 0.6 miles, but with no indication of difficulty. In addition, for us aging photographers, there is a list of 25 roadside waterfalls, with great directions for finding them. I also recommend Kevin Adams’ North Carolina Waterfalls – A hiking and Photography Guide. Although a bit more outdated than Hiking Waterfalls in North Carolina, this guide provides much more information for the photographer. It includes vantage points, time of day and seasonal lighting considerations, and recommendations for wide-angle or telephoto shooting perspectives. A great website for researching North Carolina waterfalls, scenic drives, attractions, lodging, and dining is RomanticAsheville.com, an Asheville and North Carolina Mountains Travel Guide. 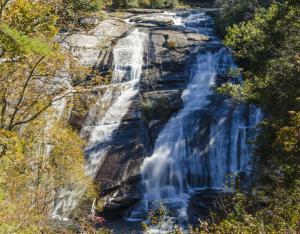 The site has detailed information on many North Carolina waterfalls. 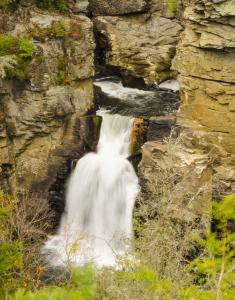 There is a page with detailed information for Linville Falls you should check out. For the location and directions to Linville Falls, see the Getting to Lineville Falls section at the end of this article. The Hiking Waterfalls in North Carolina guide categorized the hike as Easy to Moderate, 0.7 miles through old growth forest to the Chimney View, for a total 1.4 mile roundtrip. I sometimes overestimate my ability and physical endurance, so I focused on the Easy rating and the relatively short one way distance. I figured that I could rest up while at the Chimney Falls overlook while shooting pictures, and make it out and back with relative ease. After all, I had a lightweight photo backpack and a set of trekking poles. If sections of the trail were “moderate,” how hard could they be? I was wrong. The “easy” part of the hike was probably the first couple of hundred yards beyond the visitor center. The trail very quickly got steeper and steeper with long uphill and downhill sections over rocks and roots. After a while, it started to feel like a cardiac stress test. As younger folks passed me by, I had to stop and rest several times before getting to the steps down to the overlook. The steps themselves were rough timber and rock, necessitating long hip-wrenching strides to make it down to the overlook. If it weren’t for my trekking poles, I couldn’t have made it out and back (I’ll post an article on trekking poles soon). Linville Falls is magnificent, but if you have hip, knee, or endurance problems, this hike is probably not for you. Part 2 will talk about two much more accessible waterfalls south of Asheville, NC and provide a tip for vehicle access for persons with disabilities. My photo gear on this waterfall trek included a Nikon D7000 (now replaced by the D7100), a Nikon 18-300 mm stabilized zoom lens, a Nikon ML-3 wireless remote, and an Induro CT-214 carbon fiber tripod, with a Really Right Stuff BH-55 ball head. All the gear was carried in a light weight Lowepro Flipside Sport 20L Camera Daypack. I also used a pair of Black Diamond Alpine Carbon Cork trekking poles to negotiate the steep terrain.